Hobby Mounts is a UK based company which complies with UK consumer law including the Sales of Goods Act 1979 and Consumer Contracts Regulations. For more information regarding returns and cancellations please see our returns page. By using this website you are agreeing to these terms and to uphold the UK Laws associated with it. Hobby Mounts disclaims damages of any kind, compensatory, direct, indirect or consequential damages, loss of data, income or profit, loss of or damage to property and claims of third parties implied or otherwise relating to use of this site. Depending on your order value, delivery address and products ordered, we reserve the right to cancel and refund orders which are from unconfirmed PayPal addresses. Please take the time to confirm your PayPal address before ordering to ensure problems don't occur with your order. Hobby Mounts make every effort to describe and display the products we sell using manufacturer's websites, catalogues, our own photography and often our own descriptions of the products. Although we aim for every picture, price and description to be 100% accurate, mistakes can occur so let us know if you see or read something that isn’t correct. If you have purchased something based on a picture, price or description on the website which turns out to be incorrect, please see our returns section. Our contract is only made after delivery of goods. Hobby Mounts cannot be held responsible for the failure or delay in delivering orders to you if this is caused by an independant company or any event or circumstance that is beyond our control such as, but not exclusively, delivery companies, couriers, airlines, strikes, floods, fires, accidents, etc. We take every care to ensure our website is up to date however there may be times when an item shown on our website is out of stock. If this is the case then we will contact you at the earliest opportunity. You will then have the right to cancel your order and receive a full refund. If you decide not to cancel we will ensure every effort is made to get your order to you as quickly as possible. Any orders that contains shortages or errors in goods received need to be notified in writing within 7 days of receipt. Any claims for missing or short orders received after this time cannot be claimed. Please check your order contents upon receipt to save any confusion. Returns subject to terms and conditions below. a) Items are able to be returned within 14 days of receipt*, unopened, in their original undamaged packaging, fit for resale and with tags (if applicable) at the buyers cost. You are required to return items using a suitable method of posting that allows proof of delivery. b) Please complete our online returns form to request an RMA number allowing us to track and deal with your return effectively. c) The total refund amount will be for value of the products ordered and returned less the cost of postage paid by Hobby Mounts unless free postage was chosen. In which case there will be no postage to be paid or refunded. d) Faulty items can be returned for full refund within 30 days from receipt. Return postage will be refunded if the item or items are found to be faulty (this does not include international orders) and they should be returned using the most economic method including insurance if appropriate. Any items returned are the responsibility of the sender until they arrive with us. All returns should be sent back with proof of delivery required for your peace of mind and security. This also applies for faulty items, outside of the 30 day refund rules. Returned products sent back without first completing a Returns Request or not including the original invoice may not be actioned until we can allocate that order to an individual for replacement, repair or refund. Opened or used items returned as faulty which are found to be fault free, may incur a returns postage fee, currently charged at £9.50 including VAT. Opened, damaged, damaged packaging or used items returned due to order error, change of mind, no longer required will not be refunded unless they are in a suitable condition for resale. Incorrect orders, missing items, damaged goods. If you find your order is incorrect, has missing items or goods have arrived damaged please contact us via email at: info@hobbymounts.co.uk within 14 days of your order arriving. Failure to notify us within this time frame will void all claims and does not affect your statutory rights. We aim to despatch all orders placed before 2pm on the same day, providing the order is not placed at the weekend, on a public bank holiday or over the few days we are closed for the Xmas period. Hobby Mounts will always get proof of postage for our protection and yours. Items with a value over £99 will require a signature on delivery. Please bear this in mind when ordering as someone will need to be available to receive your delivery. We may choose to use a courier service at our discretion, please leave a note in your order comments if this is not something you would like. 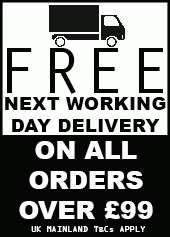 Delivery to Mainland UK is free of charge on orders of £99 and over. We will not ship high value orders to unconfirmed PayPal delivery addresses. If your PayPal delivery address is not confirmed, please contact us prior to ordering for other payment methods and/or advice for confirming your PayPal address. We reserve the right to cancel and refund any order placed if delivery is requested to an unconfirmed PayPal address. Next day delivery is not available outside of Mainland UK for certain orders. If you require next day delivery outside of Mainland UK, please confirm we are able to offer this service before placing your order. All Europe & Worldwide deliveries are made via Royal Mail "Airmail" International Signed For service. We will not ship high value orders to unconfirmed PayPal delivery addresses. Argentina, Australia, Austria, Belgium, Brazil, Bulgaria, Canada, Chile, China, Costa Rica, Cyprus, Czech Republic, Denmark, Dominican Republic, Ecuador, Estonia, France, Finland, French Guiana, Germany, Gibraltar, Greece, Guadeloupe, Hong Kong, Hungary, Iceland, India, Indonesia, Ireland, Israel, Italy, Jamaica, Japan, Latvia, Liechtenstien, Lithuania, Luxembourg, Malaysia, Malta, Martinique, Mexico, Netherlands, New Zealand, Norway, Philippines, Poland, Portugal, Romania, Reunion, San Marino, Singapore, Slovakia, Slovenia, South Korea, Spain, Sweden, Switzerland, Taiwan, Thailand, Turkey, United Arab Emirates, United Kingdom, United States, Uruguay, Venezuela. If your PayPal address is not confirmed and/or your country is not in the list above, please contact us prior to ordering with the items required and your delivery address. We reserve the right to cancel and refund any order placed if delivery is requested to an unconfirmed PayPal address. When initially placing your order, it may appear as pending or processing. At this stage payment may or may not have been accepted depending on the payment method used. We consider an order as officially accepted when the order status is changed to shipped and you have been notified by email. Only at this stage do we consider and order to have been placed and accepted. * your statutory rights are not affected. Periodically we reward website visitors signing up to receive our newsletter with a chance to win products for free. During the Newsletter signup period, usually one calendar month, we'll choose one lucky winner from the list of new signups and award them the prize for that month.